We received entries from all over the world. Poverty is a difficult problem to diagnose let alone solve but nonetheless as designers we can address different aspects of poverty and hope by dealing with each point in the problem, we can begin to collapse the systemic process and give back the dignity every person deserves. We judged based on concept, cost to implement, and deployment. Thank you to all the entrants for your hard work. Hit the jump to see the winners. 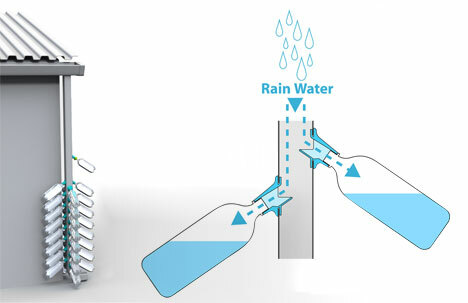 Rain water is a largely untapped resource, especially in many developing countries where clean water is scarce. Water harvesting consists of three main components: a catchment area (generally a roof), a gutter system and a water storage area. The water storage area is by far the most expensive portion of this system, which makes it out of reach for many families. 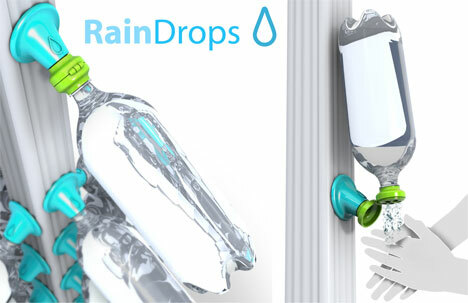 The RainDrops system simply allows people to adapt standard plastic bottles to an existing gutter system to collect rain water. This changes water storage from the most to the least expensive part of the system. 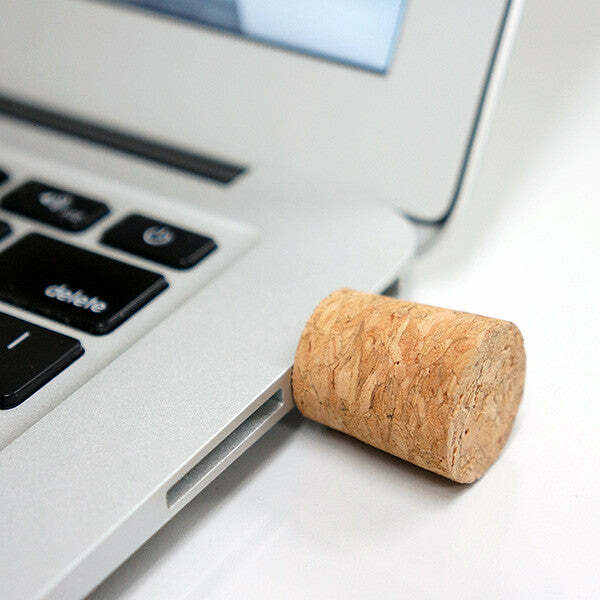 These are much easier to clean and replace than larger storage units. The repurposing of these plastic bottles will also give value to many bottles that are otherwise headed for landfills. Corruption in the water sector is a real problem in many developing countries. The scalability of this system helps to give more power to the communities in need. For many communities in the developing world a lack of good hygiene can have deadly consequences. Washing your hands is one of the best ways to prevent the distribution of bacteria. Nearly six thousand children in Kenya die each year from diarrheal diseases, and it is estimated that the simple act of proper hand washing could cut that number in half (kwaho.org). 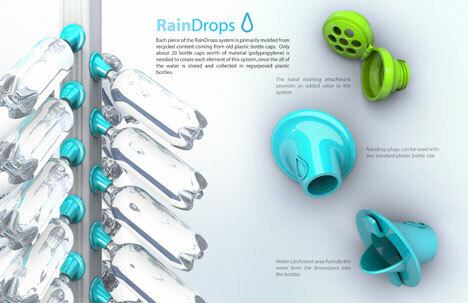 The RainDrops system includes an attachment that allows people to create running water to wash their hands. Another large benefit to using plastic bottles as a water collection system is that it fits in nicely with the process called SODIS, which uses a combination of the suns UV rays and heat to remove pathogenic microorganisms that cause disease. 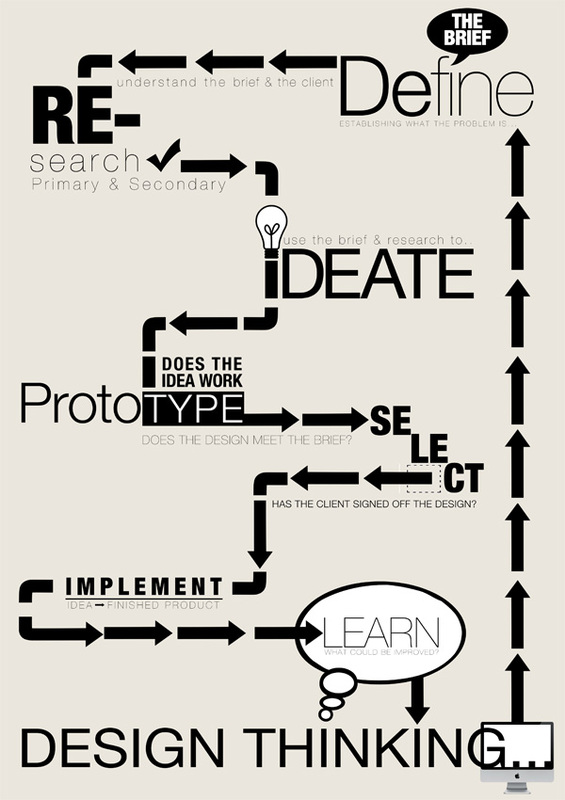 This process is spreading across many developing countries due to its effectiveness and low cost. Ultimately the goal of this system is to create a means for people to be able to collect water, which is an essential resource for life. By helping them relieve the monetary burden in an essential area like access to clean water, people will have more economic flexibility to start address unmet needs in other areas. 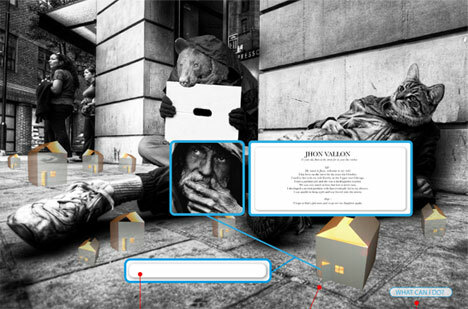 A conceptual project created to establish a link between the homeless and the rest of the community. I wanted to change the image of the homeless by letting them tell their stories in a personal letter; to place a face on a population we often try our hardest to ignore. Hidden City is inspired by the cardboard signs we are so use to seeing. 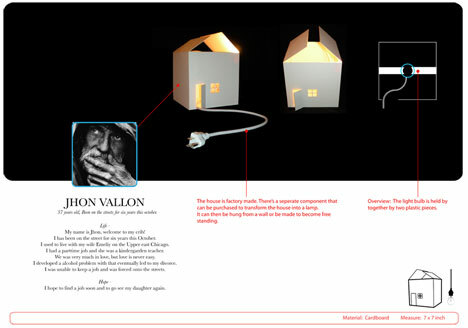 A homeless person would be given a small cardboard replica of a house that folds together. Postage is prepaid and can be dropped in the mailbox to whomever they wish to send it to. The receiver assembles the house and can go to the official website to reply to the letter. The website is also a portal to many other shares stories of how, why, and when. . . The portal is the starting point where people can feel akin to those less fortunate and find out how they can directly get involved at the local level. Hidden City was designed to create awareness – the first step in understanding and solving a problem is recognizing the growing epidemic. The next time you walk or drive past a homeless person, what’s your reaction? Do you look straight ahead and pretend no one is there? Are you fearful of something about them? What do they represent to you? It’s time to remember these are people just like you and I. The Trash Sleeping Bag concept makes use of existing behavior by the homeless who often collect and sort thru garbage to recycle for money. The money they receive is never enough to uplift them from their situation and break the cycle of poverty. Local business and grocers in support with the local city council could get together and create a voucher system where city trash can be exchanged for food, water, and clothes. 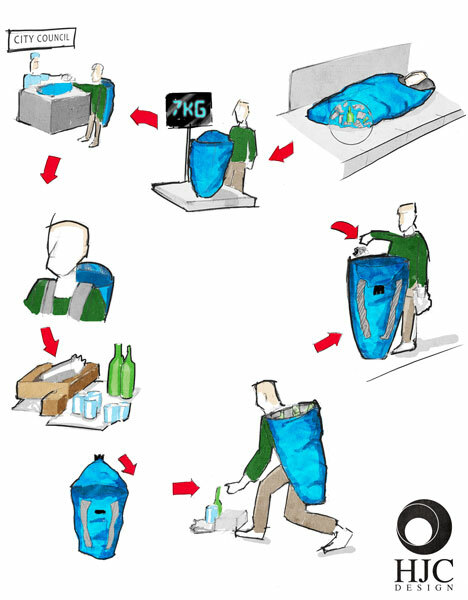 The Trash Sleeping Bag has a double wall chamber by where collected street trash can provide insulation. The bags are inexpensive to produce and distribute. They provide a basic necessity to both the homeless who often sleep in the cold and to local communities that spend millions a year trying to clean up street trash. Many of the foods are tossed out by grocers because they are no longer fit for sale but still plenty good for consumption. Instead of throwing away millions of dollars of food, we use it to uplift people out of poverty in the hopes they can help themselves. Red Cross was designed to address the basic need of medical care. People above, as well as below the national poverty level all face this titan issue. “What will I do if I get hurt”? This question haunts everyone who does not have medical insurance. The homeless have absolutely no light at the end of the tunnel. They could lose a limb or die, just from a simple infection that started with a small cut. My goal for this project was to not only design a tangible structure for these people to use, but to create a homeless infrastructure. I want them to not only survive, but move forward in a positive way, and with that create the social interaction that is needed for homeless people to grow socially as well as economically. The first and most important issue that I addressed was the need for homeless people to have a way to move forward from their current economical and social status. I created a system that would provide work for the homeless that they could handle with their lack of transportation and unappealing textile appearance. I accomplished this by laying out simple jobs like collecting garbage, collecting cans, working at homeless shelters, or general city clean up. In turn an organization reimburses their work with Red Cross Credit. 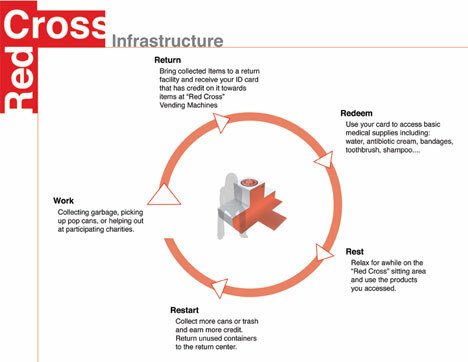 This puts credit on their homeless ID cards and allows them access to Red Cross vending machines. They continue this process to access other things. This may not be the job that they once had but it is still a job that can give them a feeling of accomplishment that we all need. It also helps the city with clean up issues. 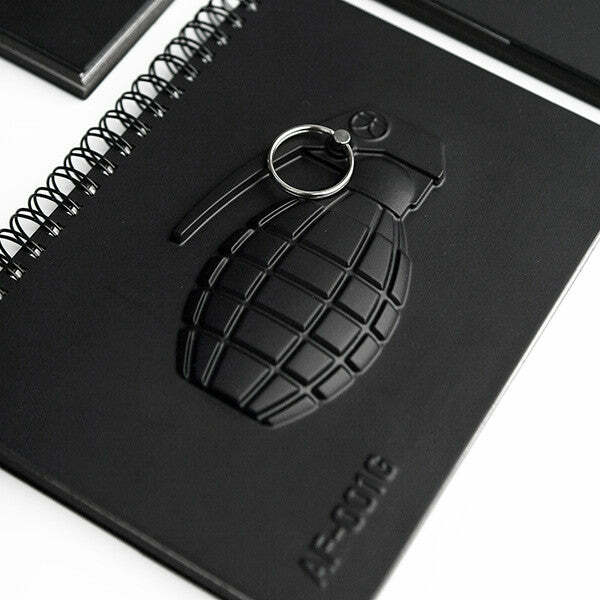 The second issue was creating this tangible structure. I wanted to use iconography to make it easy for any person to recognize. I decided to use the symbol of the “red cross” to convey that this structure can provide medical help. 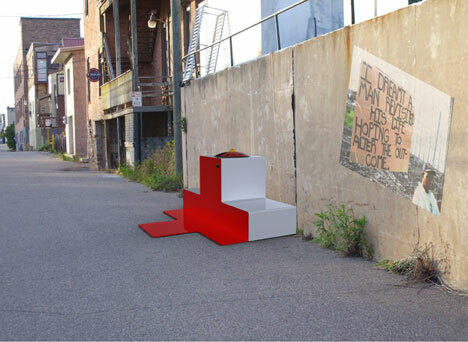 I incorporated seating on either side of the structure and put a rubber mat on the ground that provides a visual continuation of the Red Cross symbol. 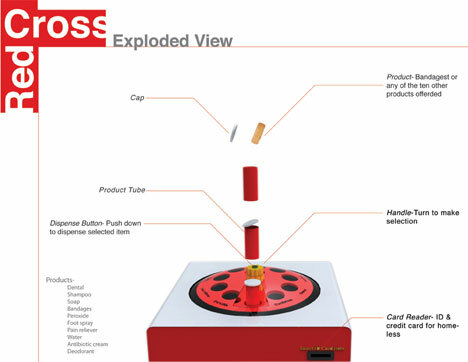 The internal working is a simple carrousel design that cut back on manufacturing costs and simplifies use. The idea behind this design is to address a scary issue that we still have. With all our accomplishments we have not yet overcome this most basic need. That is a community that is taking care of the people in it. 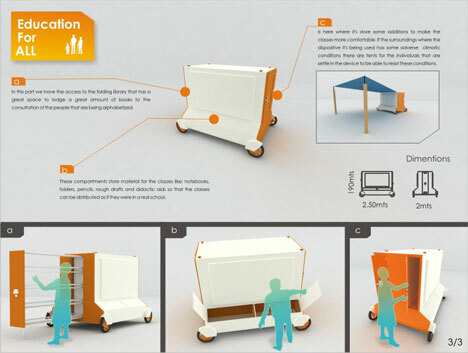 My dream is to design more of these objects to meet other needs like shelter and clothing. We can no longer let this abandonment of our poor stand. We need to use design and every aspect of this world to fix this problem once and for all. Poverty is a serious problem that many people in every country around the world face, however it is also a problem that I don’t think can ever be completely resolved. This is a very unfortunate situation that thousands of people have to deal with and with help from the more fortunate people; their situations can be improved. When I began doing research for this design project it became very evident what homeless individuals needed for basic survival and also what they could do without. One thing that is obvious that no human being can do without is clean drinking water. It doesn’t matter if a homeless person lives in a New York City alley way or in an arid third world country clean drinking water is essential to life. Something else that is obvious that homeless people do not have is a home or shelter in general. It is typical to see homeless people using cardboard boxes or any other found material to keep a barrier between them and the elements. With these two important facts in mind I began to formulate ideas on how these problems could be solved, the end result is H2OME. 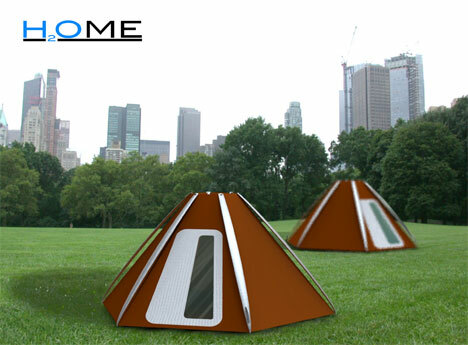 H2OME provides the user with shelter from the elements and cold and at the same time it acts as a water collection/filtration system so clean, safe drinking water is available at all times. 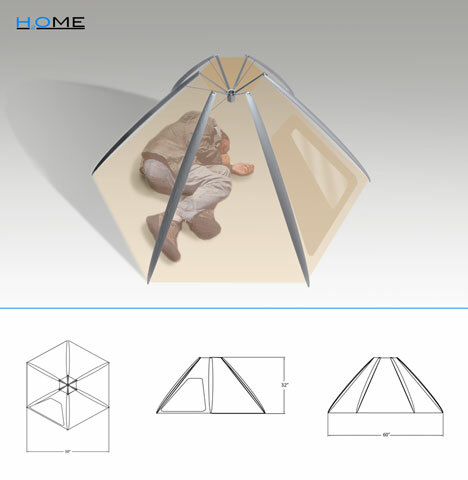 When the H2OME is being used as a shelter the specific shape of the structure collects rainwater or any water for that matter and funnels it through a carbon water filter, which then empties into a water bladder for storage. When H2OME needs to be transported it easily collapses to a compact cylindrical shape that will hold and protect the collected water and provide insulation to it as well. The compact shape allows for H2OME to be strapped directly to the back, attached to a backpack, or stored in almost any cart. 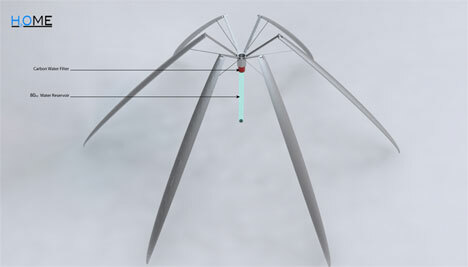 A flexible water hose can be attached to the water reservoir to allow for easy access while the H2OME is collapsed. 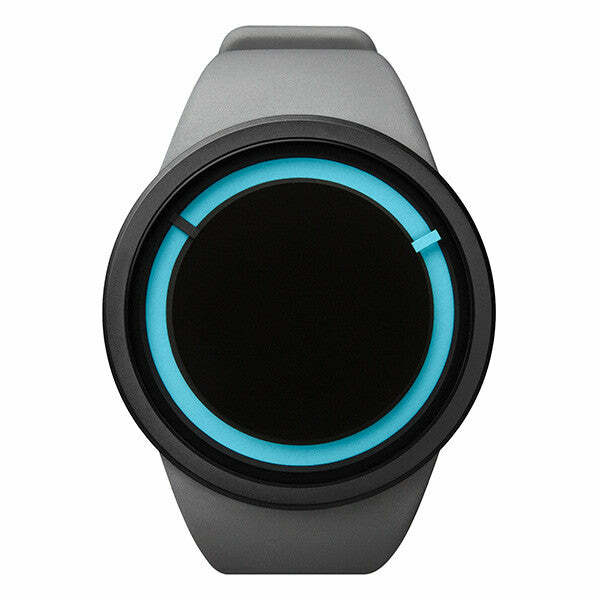 Through out the entire design process for H2OME, budget and sustainability where kept in mind. The supporting legs are constructed out of aluminum from 100% recycled soda cans and the protective barrier is made from the same material as emergency blankets. The end result is a very cost effective product that can easily and affordably be donated by a city or community organization. In many parts of the world the education programs are inadequate, mostly in the third world countries. This right does not reach the most vulnerable communities. It has been said before but education IS the key to solving all our problems, even poverty. 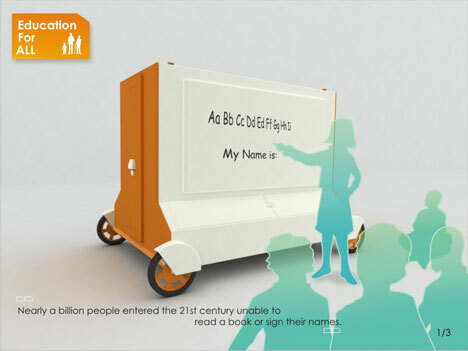 Education for All is based around a book-mobile. Most impoverished children in the world have never even see a book. The system has storage for books, didactic materials, and lesson plans. It can be transported by a truck, motorcycle or even a helicopter to the most remote regions. It is made in fiber glass which doubles as a wonderful white board to conduct lessons with. Huge thank you to our sponsors who all jumped in to help make this contest a success. We thank you so very much for donating your time and for rewarding our winners with such awesome gifts. 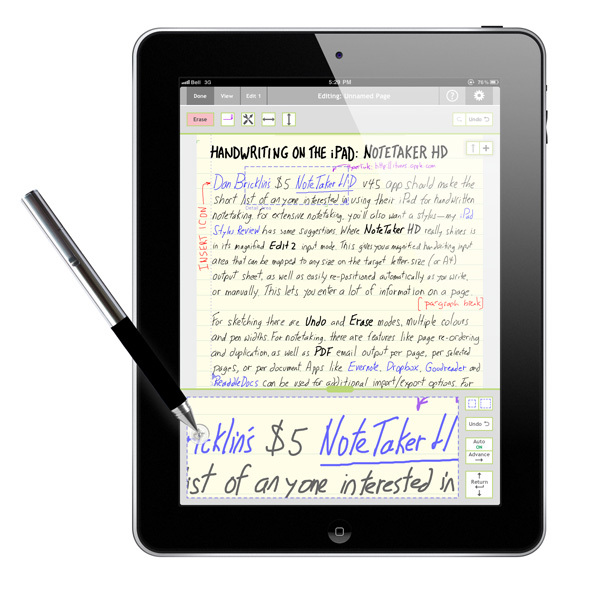 Friday Giveaway: 4 Adonit Jot Flip + Refill Bundles for 4 Lucky Winners! I applaud the great effort & designs!! These are not solutions to these poor homeless individuals & families who are forced to live on the streets!! We should be constructing thoughts & ideas how to relieve them and place them in homes/apartment! It’s a very sad situation here in the United States let alone countries that are poverty stricken! !